The move comes following a six month vacancy for the post. 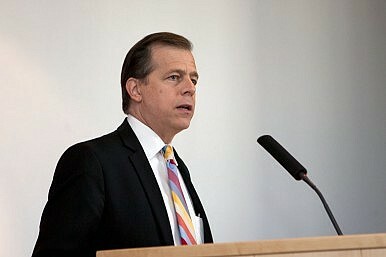 U.S. President Barack Obama nominated former U.S. envoy for North Korea policy Glyn Davies as ambassador to Thailand on Monday following a six month vacancy for the post, media outlets reported. Davies’ appointment, which has to be approved by the Senate, comes amid strained ties between the United States and Thailand, which is Washington’s oldest Asian ally. As The Diplomat reported previously, the United States had suspended some aid and later downgraded its annual Cobra Gold exercises with Bangkok following a coup last May. Ties looked to be deteriorating even further after U.S. assistant secretary of state for East Asian and Pacific Affairs Daniel Russel publicly rebuked the ruling junta in a speech at Chulalongkorn University in Bangkok on January 26, which angered officials including Thai Prime Minister Prayuth Chan-o-Cha. It is still unclear when the ruling junta government will fully restore civilian rule, with elections repeatedly postponed and martial law – initially in place indefinitely – recently replaced with what critics say is something much worse. But Thailand has been keen to restore relations with the United States in recent months, with its new ambassador to Washington Pisan Manapawat publicly saying following his confirmation in February that his “two urgent tasks” were to improve Bangkok’s relations with Washington and help upgrade his country’s dismal position in the U.S. State Department’s annual Trafficking Persons Report. Davies is a career member of the US Foreign Service and is currently senior adviser in the Bureau of East Asian and Pacific Affairs at the State Department. He served as special representative for North Korea policy from 2012 to 2014, and before that was US envoy to the International Atomic Energy Agency in Vienna from 2009 to 2012. If confirmed, Davies would replace Kristie Kenney, who left her post in November and is now a career ambassador and deputy assistant secretary for public diplomacy and public affairs at the Bureau of East Asian and Pacific Affairs at the State Department. During her tenure, which saw Thailand endure years of political instability and a coup, Kenney had garnered a celebrity status of sorts among some Thais, making a conscious effort to engage with regular Thais and maintaining a very active presence on Twitter as well.